Hey, you want to try one of the 4-Minute Miracle Bodyweight Workouts that I just added to the Home Workout Revolution program? This one is intense. So don’t say I didn’t warn you. I think you’ll enjoy this one, but trust me, it gives my legendary “Punisher” workout a run for its money. There is NO rest in the 4-minutes. You just give it and go…and give it! Make sure to watch the video version and see me struggle through this one. That 4-minutes is tougher than it sounds. Get all of the NO-equipment, follow-along bodyweight fat burning workout videos from the Home Workout Revolution site today. As a FREE bonus, you’ll also receive the brand NEW 4-Minute Miracles and 6-Minute 6-packer videos. “I’ve been using the Home Workout Revolution program for a few weeks now and have to say that I’m seriously impressed. There is such a wealth of quality information and workouts included with this program. The emphasis on good form during the exercises is making a big difference to my training and the videos provide much needed motivation when training solo. I’m happy to help! This HWR project has been a Labor of Love and is literally the BEST program I’ve ever created – even better than the 24/7 Fat Loss Workouts. So say goodbye to boring cardio. Give up the gym membership. 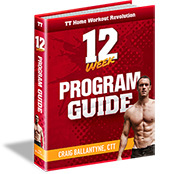 And get ripped with the Home Workout Revolution bodyweight exercises today. All of the workouts are fast and simple to do. But tough, and will make you sweat. You’ll be shocked at what you can do in just a short time with your own bodyweight. I’ve trained over 97,000 people with my Turbulence Training system, and I’ve created hundreds of workouts, but if I had to give you the ultimate bodyweight fat loss workout that gets you ripped and fit, this is the one and only program I know that does all of that at once. …you’ll finally have the encouragement and social support you need to stick with your workout program. Plus, you’ll get to watch an expert do every rep of every exercise, so you’ll know exactly how to do perfect form. And finally, because the workouts are short, can be done at home, and don’t require any equipment, there’s no more excuses for missing a workout. Get your 71 follow along workout videos that you can use anytime, anywhere, to get amazing results. Say goodbye to equipment and long workouts, and hello to fast results thanks to short, fun workouts.